Polish rabbi; born 1726; died at Posen 1801. He was a man of wealth and influence, and of great piety. His father-in-law, R. Ezekiel Landau of Prague, frequently cites him in his "Noda'bi-Yehudah." Joseph was successively rabbi of Yaworow, Sokoli, and Posen. 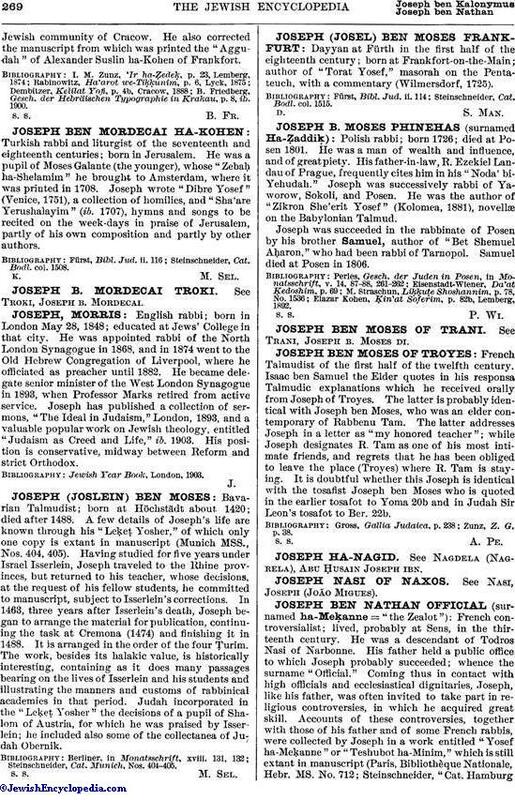 He was the author of "Zikron She'erit Yosef" (Kolomea, 1881), novellæ on the Babylonian Talmud. Joseph was succeeded in the rabbinate of Posen by his brother Samuel, author of "Bet Shemuel Aḥaron," who had been rabbi of Tarnopol. Samuel died at Posen in 1806. Elazar Kohen, Ḳin'at Soferim, p. 82b, Lemberg, 1892.